Here at Zebra Eclipse Studios a link herd is triggered when there’s enough interesting stories about the common evolution of marketing and publishing to share in a roundup. Sometimes link herds are short and snappy. Not today, today’s link herd is a catch-up that stretches back a few weeks. LinkedIn has been something of a frenemy. But now, The Wall Street Journal has gone full-on hostile by dropping its LinkedIn sharing button from its article pages. The site works with around 35 publishers, including Mental Floss, Maxim and Wired. Seven of those sites have agreed in turn to post Daily Dot stories on their own Facebook pages. Shouldn’t be a huge surprise but John Mueller, one of Google’s most vocal engineers, has confirmed that publishers approved for Google News don’t get a ranking boost in web search. Since they are doing a good job of dragging the fine art world into in the 21st century, Business Insider decided it was time to interview them, while having a look round their Soho gallery. What demands do vloggers make of brands wanting to work with them? They need clarity, control and plenty of time. Now That The FTC Has Spoken On Native Advertising, What’s Next? The days of playing fast and easy in native advertising are over. Slant News is growing and it pays its crowdsourced content creators up with 70% of the ad revenue their stories earn. New British computer game publisher and developer created as The Catalis Group merges acquisitions and ditches old brands. What were the biggest stories on Facebook in 2015? NewsWhip’s 2015 roundup shows just how important and huge a viral success can be – but also how rare and hard it is. Many venture-backed publishers are coming up to the limits of scale. Their models were based on eye-popping audience-growth figures and the presumption that business would follow. That’s not always the case. And traffic growth inevitably hits a ceiling. Trying quizzes instead of paywalls. Will it work? Testing the new future where ad blocking is common and alternative approaches scarce. Medium offering itself up to professional publishers as a platform. Who’s in control? Are publishers in a losing battle with content distribution platforms? Third-party distribution channels are increasingly prominent part of the digital publishing landscape, but instead of rejecting channels that don’t offer full ownership and control, many publishers are embracing them. The King is Dead, long live the King. Just weeks after Zoo and FHM close the Lad Bibe is said to be raising £20M. It employs 70 people, his highly profitable and has 10.5m fans. Spoilers: SEO, lack of promotion, length/interest. community, involvement and giving up too soon. More bloggers are now client focused; spending up to 6 hours on a post, producing more long form content and 64% write more than one blog. Do you agree with Mike Butcher: Is the press release dead? Article discusses whether there’s a role for the humble press release in today’s digital landscape. From Zebra Eclipse’s point of view it writes, as a given, that publishers and marketers are on a common evolutionary path. We’re all publishers now. A new set of search results for publishers right at the top of Google. There’s likely more involved than setting the right schema markup on your posts; the publisher will also be ona whitelist (as with Google News) to qualify in the first place. Ad blocking started as an initiative by independent developers who wanted to improve our browsing experience. Now that at least one company, Apple, has made Content Blocking “official”, ad-supported publishing business models are in trouble. What is the difference between a paid-for article praising a product and an article praising the exact same product in which no money has changed hands? An interesting story of a media company that put SEO before pageviews which resulted in better loyalty, improved SEO and more pageviews. Publishers, platforms and agencies – launching agencies. In this case all three have created a 12-person agency called Truffle Pig. What’s this? A publisher creating an agency to help with content publishing? We’re all publishers now. 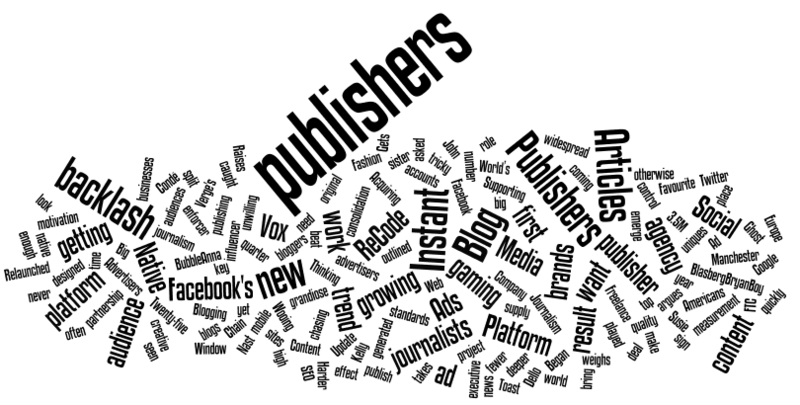 A lengthy Link Herd today as we catch up with the the ins-and-outs of “We’re all publishers now”. We see some of the usual suspects here including the reoccurring bad-boy; publishers are struggling in the face of dropping ad revenue and the rise of alternative platforms. This week we can wonder whether Facebook has a solution is about to put the boot in. Should publishers write for Facebook in an ad-revenue sharing deal? Is that evolution or throwing in the towel? Ben Thompson provides some interesting thoughts. So people say, “Oh, Twitter doesn’t send that much traffic” — but we have this intuitive feeling that it’s more influential, and has a bigger effect [than people think]. Lots of people in the media see it. … The way that other blogs and publishers found our dress story was from the tweet, and they clicked through, and they re-shared, and posted it on their site, and that continued the cascade as well. We’re all publishers now but this piece from Brian Morrissey argues that all publishers are Buzzfeed. This is both essential for publishers needing page impressions but also the road to trouble as Buzzfeed will do it better. Vloggers will find it much harder to get paid to show a brand’s logo as an overlay. Google’s banned the practise unless the overlap was bought via them as a standard media deal. Livefyre which is both a comment platform and a large publisher content marketing tool has raised shy of $50m in another round of funding. Adobe and Salesforces are onboard as backers. Livefyre’s content tools are beyond this blogger’s budget but I’d very much like to see more community injected into their comment platform. Linkbait man Lyndon Antcliff takes his history of SEO and joins the cause. He recommends “SEOs should think more like a publisher”. 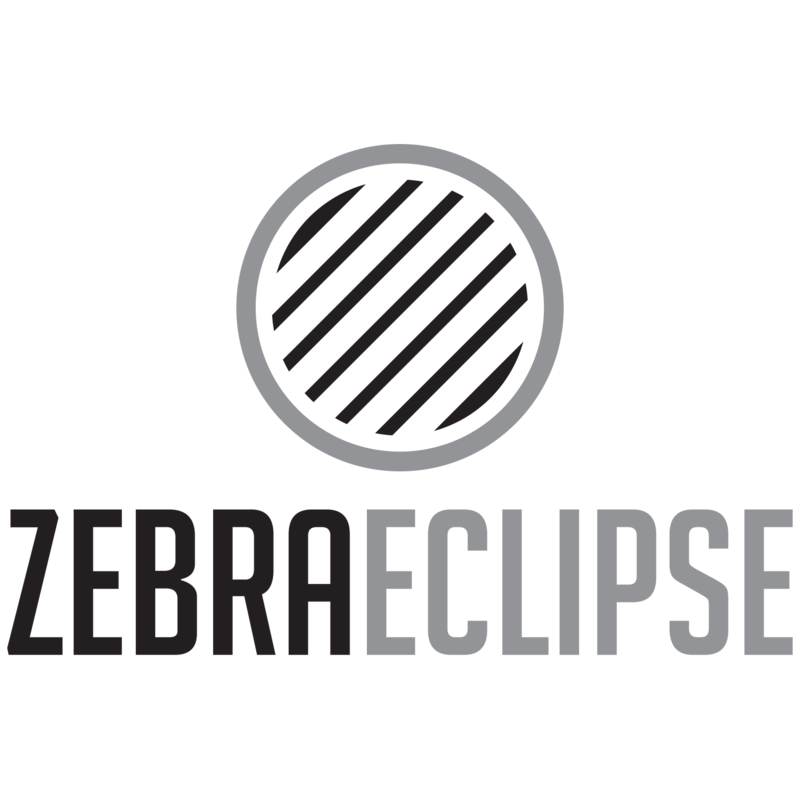 In this week’s link Herd we’ve news of Tumblr creating an agency – the strongest example of Zebra Eclipse’s philosophy we’ve seen this year. We’re all publishers now. Also; you’ll notice a new look to this little blog. Black, white and read all over. Are media owners now more attractive than media shops? Media Week explores the issue of whether marketers would now be better off working for media platforms rather than media shops (whatever a media shop is today). We’re all publishers now – and Tumblr knows that. It has created an agency called “The Creatrs Network” for media agencies and brands to tap into. It should be a win-win for everyone involved; with the brands offering cash and audiences and creatrs offering talent and audiences. Flipboard has added the ability for publishers to promote their content. Levi’s and NARS Cosmetic will be the first two brands to distribute on the new Promoted Items feed. Will media agencies become the new creatives? 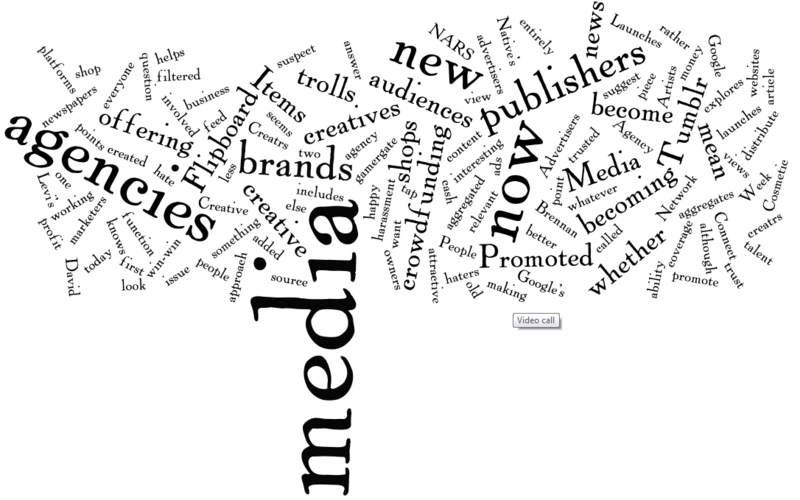 A look by Media Native’s David Brennan on whether “media agencies” are becoming the new “creatives”. It’s an interesting approach to this old question with some relevant points. I suspect the answer is both creative and media agencies are becoming something else entirely – although this article seems to suggest creative agencies are less happy about it. What does this mean for newspapers? People trust Google’s aggregated view of the news more than any one piece of coverage. Does this mean people want filtered views? We’re all publishers now and that includes the trolls of gamergate. Some of these trolls are making money off crowdfunding and ads. At what point does hate become a business?